You’re asked to calculate the amount after 3 years with £4500 and a 4% compound interest rate. The main issue is to change the 104% to 1.04 and then you can plug the numbers directly into your calculator – these type of GCSE questions are generally on the calculator paper. 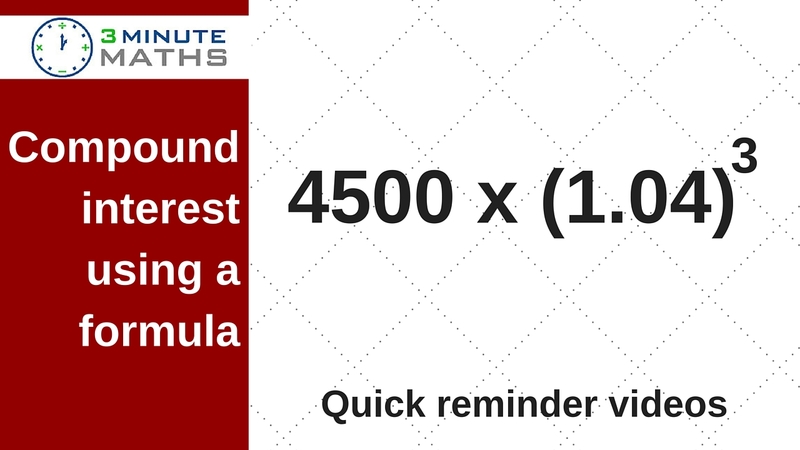 I’ve also added a couple of additional videos – one to show how the formula can be used to calculate compound decrease, the other to calculate the interest rate when you know how much you’ve earned after 2 years. Both of these types of questions regularly appear in GCSE mathematics questions on compound interest using a formula. 4% is actually 104% as you need to leave the original 100% in the bank. This will change – “104%” means 104/100 which equals 1.04.